Let's be honest, not many people were raised vegan. This movement has started to take off with so much momentum it can be a little bit, err a lot bit overwhelming. I remember when we decided to make the switch it was like information overload. I'm an all or nothing kinda gal, if you stick around long enough you'll see that can be a good thing, or sometimes a bad thing, haha. I wouldn't have changed our transition for the world. It has been one of the BEST decision we've ever made as a family. I do however, wish there was a "cheat sheet" so to speak. That's what this is! 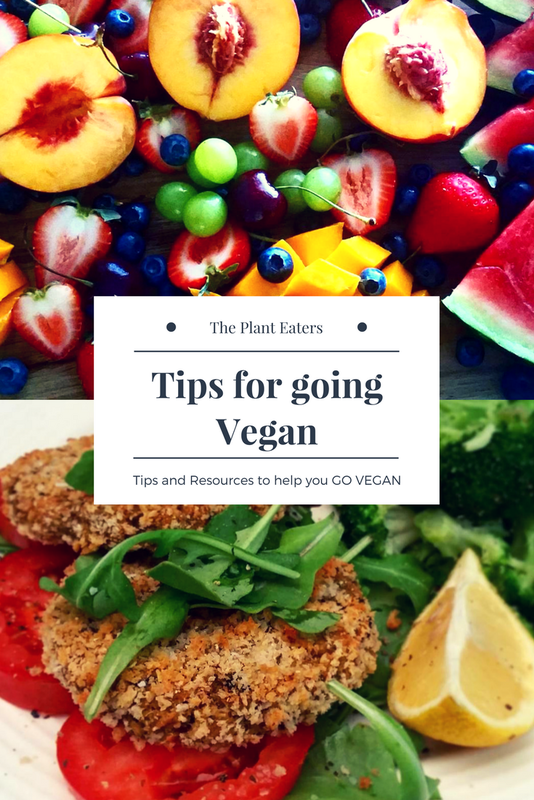 This is just what we've learned, a list of things I wish I had known before, during and after we transitioned into a Vegan Lifestyle. 1. There is no right or wrong way to be Vegan. There are many "versions" of a vegan diet. And vegan doesn't mean healthy. The actual definition of vegan "is a person that doesn't use or eat animal products". That's it, not complaicated, but lines get blurry and people get confused when people have different lifestyles. As a family we are Ethical Vegans, that eat a Whole Foods Plant-based no oil diet. But that doesn't mean a vegan that eats vegan donuts and vegan convience foods is wrong. Just to be completely clear. If you are going vegan for health reasons whole food plant based no oil is the way to go. 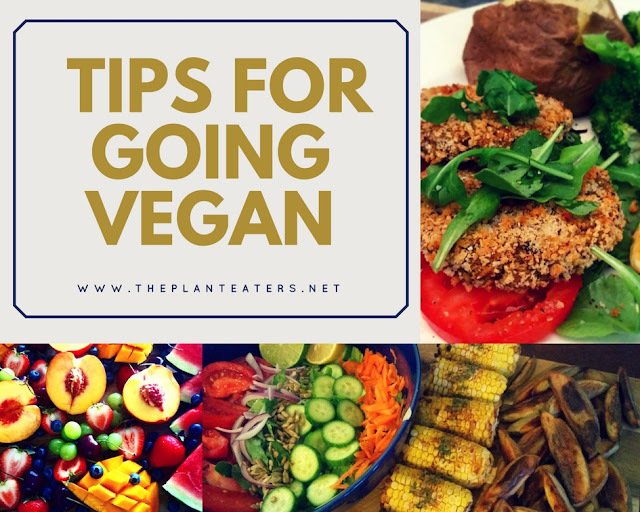 If you're going vegan for ethical reasons and are not trying to get healthy that's ok too. But, the mom in me has to tell you to eat your veggies, haha. 2. Get ALL the animal products out TODAY. I know I'm coming in strong and hard, but I wish we had. We didn't it took us longer to get them out, I'd tell myself "Oh, I'll just have 2 bite of cheese, and that's it". I know I said I was all or nothing kinda gal, and that was nothing... I literally wasn't doing myself any favors by continuing to have "2 bites". I was still contributing to cruelty, killing myself and my health just a little slower than I had been before. Why delay the inevitable and your success by continuing. It's like smoking you wouldn't tell a smoker to just have 2 more puff everyday, that would just make them want it and delay their success. If you're trying to lose weight and get healthy make 90% of you food choices Whole plant foods with no oil. For us, health is important so some of these tips lean toward health. 3. Don't be afraid to EAT ALL THE PLANTS! Even carbs! Potatoes, rice, and all the whole food starch based foods have gotten a bad wrap. These foods are full of nutrients. If you're interested in seeing the amount of vitamins and minerals in foods, www.cronometer.com it a great resource to track it. I don't suggest "counting calories", but you can put in an average day and see why you may need to adjust. All Vegetables, Fruits, Whole grains, Legumes (beans), a a small amount of nuts, seeds and avocados. At first it may be hard to eat a big volume of food at one time, so you may have to eat until your full and then eat again an hour later. Also going to the bathroom may happen more regularly due to the high fiber content in plants, but it will even out as your digestive system catches up. 4. The resources and information can be sooo confusing and overwhelming. When you are researching just stick to one topic/question that you have and study it, then move on to your next question. You'll be able to see a clear path without everything caving in on you. Here are some very helpful online resources that are full facts and can help your research health related resrouces Dr. Neal Barnard with The Physicians Committee for Responsible Medicine, Dr. Micheal Greger with Nutrition Facts.org, Dr. John McDougall, Dr. Esselstyn, Engine 2 Diet documentaries Forks Over Knives, What the Health, Vegucated, Fat, Sick and Nearly Dead. Ethical and environmental resources Peta, The Vegan Society There are also documentaries, some of which are graphic One Green Planet has a great list, and great recipe ideas. For vegan and cruelty free products Peta has a good list. 5. The saying "If you fail to plan, you are planning to fail" is very accurate in this way of life. You NEED no MUST have healthy food at your finger tips. That doesn't mean you need to prep an elaborate 5 course meal ready 3 times a day. You will burn out on that very quickly, because nobody has time for that. I always make sure when I am cooking to make more, so it doesn't feel like I'm in the kitchen for hours making meals. I have the components to make healthy, filling but delicious meals in less then 5-10 mins. I always have a big batch of plain rice/grain, any variety beans, salad mix, hummus, steamed potatoes, cut fruit, leftovers. I always try to make enough to at least have a couple lunch portions the next day. Make a big pot of your favoirte soup (Here's our favorite) and take it to work for lunch or dinner when time gets away from you, that has saved me a time or two. Yes, these take some prep but not much. This will keep accountable and make sure you don't grab (that you should have in your house anyway, haha) something that isn't on your plan. Our most favorite way to have these, are quick bowls. 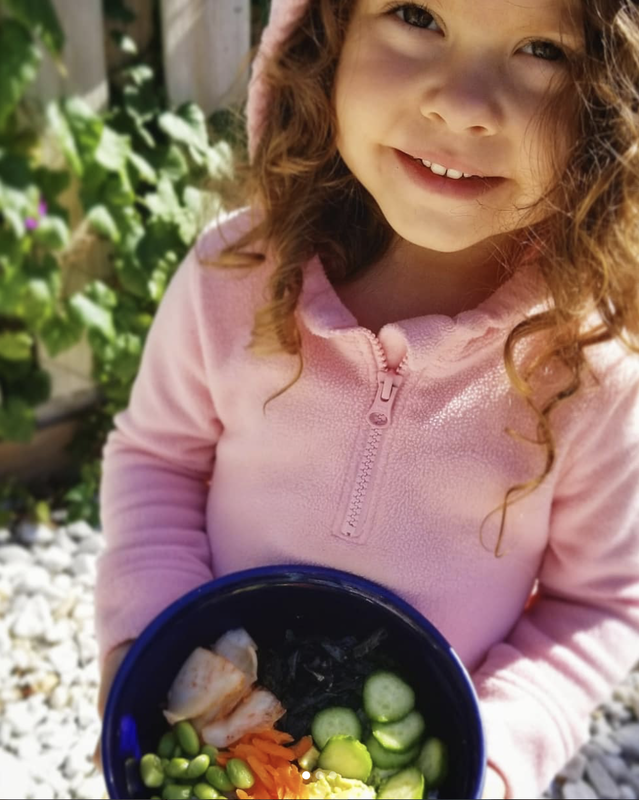 Burrito bowls, Sushi bowls, Budda bowls, of course salads but they can be easy and epic! If your looking for fast vegan convince foods Gardein, Boca, Field Roast etc. The mom is coming out again, while I LOVE that these products exist, I found that making a Rice and Bean bowl faster, haha. Scarlet holding her favorite Sushi Bowl! Scarlet holding her favorite Burrito Bowl! 6. Not everyone has "Seen the light" that we so vividly see. Duh, plants, am I right?! Your friends and family may think you have gone off the deep end. This may actually be the hardest part when changing your lifestyle. You'll get questions and comments like "Where do you get your protien?" "What do you eat? ", "I could never give up cheese", "I'm going to die anyway, might as well die happy", "Humans are omnivores, see my k9's?".... and many more. You can't get upset or start an argument, after all we've ALL been there, with the blinders on and the ignorance that meat and dairy are normal and healthy. After all that's what we've been told by or Doctors and the medical community. THIS IS IMPORTANT so listen up! "Be the change you want to see". Fighting with someone about it WILL NOT change their minds. Dr. Doug Lisle has a great video about Getting along, with out going along, it an AMAZING way on how to deal with people that just don't get it. You will lead by example. Let them come to you with questions after they see how vibrate, happy and healthy you are. After you have your "footing" so speak, and more knowledge and comfortable with what you've learned. That being said their will still be people that just want to argue. You can nicely say "This is working for me and we can agree to disagree. I love you and this isn't going to come between us". DO NOT let this derail you and your progress. This leads me to my next tip. This where Facebook group and social media can help. Where like minded people can really offer support and love. 7. Join Facebook groups, follow people on Instagram and YouTube for support and ideas. 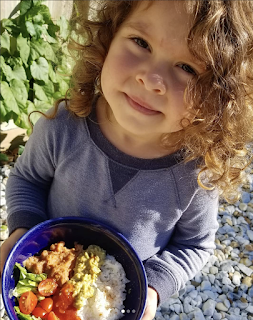 Social media is a great place to find delicious (not always the healthiest vegan recipes), there are good whole food plant based no oil groups that can help you along your health journey. There are good and bad groups and some people are trolls and just mean. Don't let these people discourage you either they are everywhere and in every corner you have to shake off the comments that don't help you and keep scrolling. DO NOT GET SUCKED INTO THE NEGATIVITY, thats exactly what they want. Here are a few of my favorite groups that are helpful and full of kind people for the healthy ones Mrs. Plant Community, Well Your World, Vegan Family Meal Planning, Plant-Based Recipe Hoarders, McDougall WFPB, Engine 2 Seven day Rescue, Plant-based Challenge. For Vegan indulgences and Veganism in general there a LOT of groups. I tend to lean towards the healthier ones because that is my goal, but if you do find or know of a great group let me know!! So this will get you started, haha. Remember take what helps you and leave the rest! 8. Supplements, this can be confusing. Some people think you need to add Protein powders and supplement with vitamins. This is my opinion... I'm not a doctor, do your research and do what is right for you and your family. We take a B12 supplement, that's it. We get enough direct sunlight on our bare skin so Vitamin D is not an issue for us. If you live in a place or can't not get enough sunlight to produce Vitamin D naturally you should take a vegan supplement. This is a great video by Dr. Barnard that covers some misconceptions about a Plant Based diet and supplements. If you do want to take a multivitamin MyKind is a great vegan brand. 9. ENJOY this new found lifestyle. It will continue to get easier as time goes by. You will always be learning and growing on the subject. If you make a mistake it is NOT the end of your progress, your next choice WILL be better than the last. By making the decision to eat more plants you're doing the absolute best thing you for your health, the planet, and animals. I am always here to help and to support you whenever you need a sounding board, to vent, to answer any questions, and if I don't have the answer we can find it together! We are in this together! Here's to YOU and the best decision you'll ever make for your health! Much Love ~ Des! Awesome blog post, Des! Please post this in Mrs. Plant Community if you haven't already! I left a message on one of your recipes on youtube but wanted to come by and kind of repeat myself. I love your channel on youtube. My husband and I really want to transition to a healthy whole foods vegan diet. Living in a small town in Australia there is not a lot of support. We decided 2018 was the year we stopped talking about it and started on the journey. We've had a week of great recipes and I want to try heaps of your recipes. Thank you so much for sharing them in video format and also on your blog.